Have you ever driven all the way to work and realized you aren’t sure how you got there? You know you were driving, but you don’t actually remember stopping at any of the lights, or using your turn signal, or changing lanes on the expressway? Well, that’s sort of what it’s like to do an Ironman. You’ve trained so hard, for so many hours. So, when the cannon goes off, you just go. All you can think about is going. You go until the end. And much of the rest is sort of a blur. 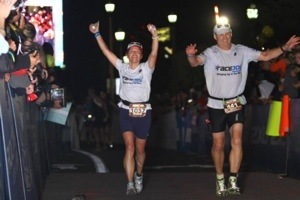 Even though you remember the moments you’ll cherish, like getting out of the water, seeing your support crew on the sidelines, or seeing – in my case – your spouse on the bike and run … you drive yourself crazy later trying to remember insignificant details like whether you ate anything that was in your special needs bag or when you decided to ditch the thing of sunscreen you carried with you for hours, just in case. Before I describe what some of my Ironman Arizona 2013 experience was like, let me describe the course a bit… The swim is one loop in Tempe Town Lake, which despite being near Phoenix, AZ – is notoriously cold compared to some other Ironman swims. The bike is a three-loop out-and-back course, with a slight uphill going out and downhill coming back. You can stop at your special needs bag on the second and third loops. The run (this year) was a two-loop course, with a stop at your special needs bag half-way through. 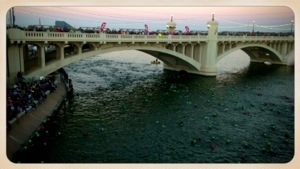 The days leading up to Ironman Arizona 2013 were nothing like I had imagined before we got to Tempe. I had packed the clothes I’d wear for our practice loop on the bike course and the run I’d do after the practice swim (since I figured I’d want to warm up somehow after getting out of what I was sure would be freezing water in Tempe Town Lake). Well, somehow between my husband having a weird-new-car-smell headache from the van we rented and a silly quest to find the only place in Tempe that sold Thai basil so we could make a favorite recipe, we did neither the bike loop nor the practice swim. (The Thai Basil fried rice was super delicious, though!). I did get in one run, but otherwise, my husband and I stressed ourselves out … running around and not giving ourselves any time for quiet reflection. And we had a rare (for us) fight that left me wondering if I wanted to do the race at all. At that point, no stupid Ironman was worth having discord between us. Stress will do that to you. Next time (if we do this again), I plan not to plan so many stupid activities before the race. Simpler and quieter is better. It might even be better if we stayed in separate rooms – to give each other space. Don’t get me wrong, my husband and I get along really well normally. We are a freakishly easy-going couple. And we had the most loving and supportive group around us for this event. Truly. (Some of you really helped us get through this unexpected rough patch. I hope you know who you are. Thank you!) But, we needed a little space and time to our individual selves. Duly noted for next time! Anyway, we got through it by the day before the race. And we were even smiling and joking with each other again on race morning. I had accepted that if the water was cold, it would be cold — whether I had done the practice swim or not. And since we had done the Computrainer version of the bike course, I felt okay about that also. I was mentally prepared for all the worst possible scenarios: hyperventilating on the swim because the cold water might take my breath away… the numerous flat tires and mechanical problems I might have on the bike (to the point that I took note of all the cut-off times just in case) … and the mystery of how I might feel on the run, possibly throwing up and walking most of it. Clad in our full wetsuits and neoprene caps, we walked down to jump in the water. We jumped in feet first as instructed, and plunged deep down. I floated back to the surface and noticed that the water was … totally normal. Not cold or anything! 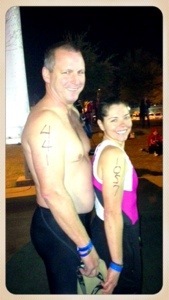 We looked at each other with a shrug and started to swim over toward the start line. We positioned ourselves just beyond the second bridge and a little to the right, toward the wall. When the cannon went off, there was plenty of jostling, some kicks and flailing of arms, but nothing like I had imagined. Someone hit me in the right goggle once, but that was the only really shocking moment. You swim awhile and go under another bridge before you turn to head back in the other direction. It took most of the first leg to the turn buoy before I got into a rhythm. The sun was in our eyes just before the turn, but much better after that. On the way back, it felt like the wake of so many out-going swimmers might be pushing us back a little. But Craig didn’t recall that when I asked him later. So, maybe I imagined it. I had to sight more on the way back, as the buoys were set at an angle, and I actually heard kayakers telling people to stay to the right. After swimming back under the last bridge and turning toward the swim exit, I was so excited to hear the announcer and the crowd. There was a bit of a back-up getting out of the water. You had to wait your turn to climb up the stairs and get hoisted out by the volunteers. But I was so relieved. Yay! The swim was done! One of the peelers pulled off my wetsuit and I ran toward the bike gear bags and change tents. I saw our support crew and they told me (thankfully) that Craig was already out and ahead of me. I knew he would be, but it was nice to have confirmation. He did the swim in 1:23. I took a pit stop before changing clothes. Thank goodness for well-placed port-o-potties after the swim! 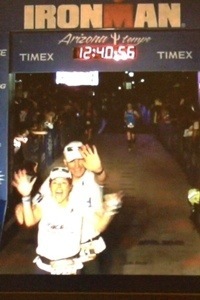 My T1 was super slow: 12:46, but I didn’t care. Ironman is a long day; better to be properly dressed and ready to jump on that bike. I put on my race belt with the GPS tracker in it – so our friends could track me using an app they developed called RaceJoy (more on this later). There was a bunch of hay or grass or something on the ground in the change tent. So, you couldn’t help but put some of it on with your socks and so forth. I decided against wearing the arm warmers and vest in my bag. It just wasn’t nearly as cold as I thought it would be. Out at my bike, I pressed the button to turn on my Garmin and started running with my bike to the Bike Out sign. I got to the mount line and looked at my Garmin. All it said was “Working…” Huh? I’d never seen it say that before. I ran by our friends, and while James was telling me (with all his past Ironman experience and wisdom) that I had all day, I kept looking at my Garmin wondering what the heck it was “Working…” on. As I mounted and got underway, I turned it off and back on a few times and finally gave up — figuring maybe it would come around. About a mile into the bike, it came to life, and – you’ll love this – after all my power meter troubles, it said, “Power Meter detected. Would you like to calibrate?” I pressed hard on the button to indicate “no” and finally saw my speed, time and mph. I figured it was about 1-2 miles off, but at least I had some point of reference for the rest of the ride. Later, I learned that Craig had exactly the same experience with his Garmin. Maybe the transition area was in some sort of Area 51-like time warp that GPS satellites can’t detect. I pushed hard on the inclines going out, trying not to draft. People were very bunched up, especially on the coned-off sections heading out of town. I enjoyed passing so many people who seemed to think that was a real hill. They’ve obviously never been up Chesterfield or Franklin Gibson, or pretty much anywhere in Western MD. Every once in a while, someone really fast would pass all of us. The pros were still out finishing their 2nd & 3rd loops, and they were flying! I had to un-clip one foot at the turn around each time, as I’m no good at tight turns. But luckily, it never caused a problem for folks behind me, since everyone seemed to really slow down there. The ride back to town is practically all downhill and very fast. On the first loop, it was amazingly fast, and I took it easy to get a rest. It was nice going over 20 mph without any effort at all. Craig said he got up to 30+ on this section. On the 2nd and 3rd loops, this section wasn’t quite as fast, because a head wind came along and continued to build for the rest of the ride. But I didn’t mind. No flats, no crashes. I was happy. We saw our support crew several places on the bike course. RaceJoy was working, and they knew right where to catch us! 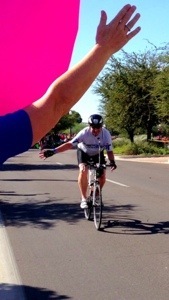 I saw our support crew a few miles into the run. They told me that Craig was about 35 minutes ahead of me. At that point I knew I probably would not catch him. I was happy he was having a great race (although I had no idea that he had lost his flask if pickle juice, which he takes for the salt, and he was actually cramping up already on the run). Not too long after seeing our group, I saw them again & was amazed. How did they get there so quickly? 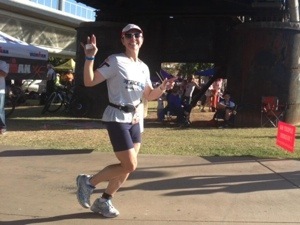 It took me a while – in my Ironman-fog – to realize that they were crossing a bridge from one side of Tempe Lake to the other – to catch each of us when they could. 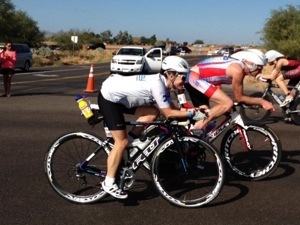 I was gaining on Craig, and made up about 20 minutes on him at one point, but then slowed down. It wasn’t until after we had both passed the 13-mile mark that I saw him going in the opposite direction. I was on an upper trail, and he was down below. We shouted to each other, and he told me about losing his pickle juice. 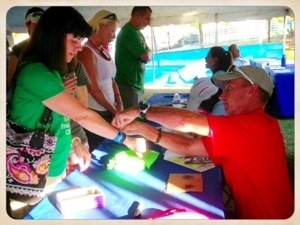 I offered him the small flask I had, but he said he had picked up another one at the special needs stop. I told him I also had Endurolytes, and he said I could give him some when I caught him. Even then, though, I could tell he was too far ahead of me. I’d have to really speed up to catch him. All I could do was keep jogging forward. Each step I took, I’d think, “well, that’s another step I don’t have to take again.” I kept wondering if I’d be able to run the whole thing or if I’d reach a point where I’d have to walk. In the end, I only walked the water stops and I only drank water, a little pickle juice, and some cola. I took my Endurolytes, Tums, more Tylenol, and some Clif Shot blocks. Luckily, I never had indigestion. I couldn’t believe it. For the last part of the run, I didn’t see our support group again, and I knew that was because they had gone to the finish to see Craig cross the line. I imagined him running down the finishing shoot and getting the best Ironman time he’d had to date. I was so happy for him. I went past the point where the finishers break off from the people starting their second loop, and a volunteer said that 12:45 was a reasonable possibility for those of us passing then. I hadn’t even thought about what my time might be until that point. I felt like I was really running slowly by then, so I decided 12:50 would be fine by me. Anything less than 13 hours would be awesome. 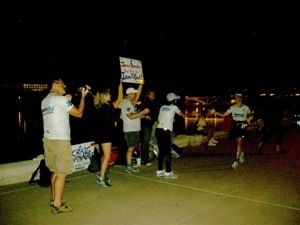 As I got to the finishing shoot, I searched the crowd in vain for our supporters. There were so many people! I was just realizing how happy I was to be there when I saw Craig waiting there for me. I couldn’t believe it! 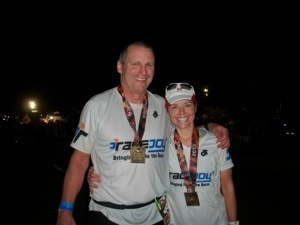 He had waiting 18 minutes for me to get there so we could cross the line together! His real finish time would have been 12:22. But instead, he got the same time as I did: 12:40! 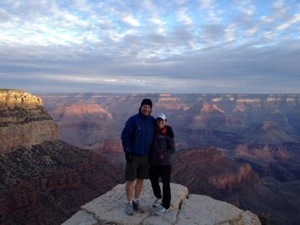 We did some wonderful sight-seeing in Sedona and the Grand Canyon in the week after the race… And now that we are back home, It is nice to reflect on this wonderful experience. Beforehand, I was thinking how nice it would be to have Thanksgiving the week after we got back, because we wouldn’t feel so guilty about eating all the food. But what hadn’t occurred to me is that we’d have so much to be thankful for. Aside from the stress-induced fight, everything was perfect. Our friends and my sister Michelle made it so special, and everyone back home poured out so much incredible support to us. I just can’t be more thankful! THANK YOU, GOD. And THANK YOU, EVERYONE! And thank you, also, to the readers of this blog. It’s supposed to be about how I donated a kidney and yet went on to live a relatively normal life. However, it turns out that I hardly ever remember to mention the kidney thing, and my life goes on to be somewhat extraordinary. I hope the same is true for other kidney donors out there. You can’t forget about it entirely. You have to take care of yourself. But I hope it doesn’t hold you back either. Two years ago, when I donated a kidney to my stepfather, I asked one of the doctors on the transplant team if I still might be able to try an Ironman – given my altered condition. He never said no, but merely said I would have to stay hydrated, listen to my body, and it would tell me if I could do it. I’m so grateful that I could. So many other people might just be able to dream of it, but I was lucky enough to do it!